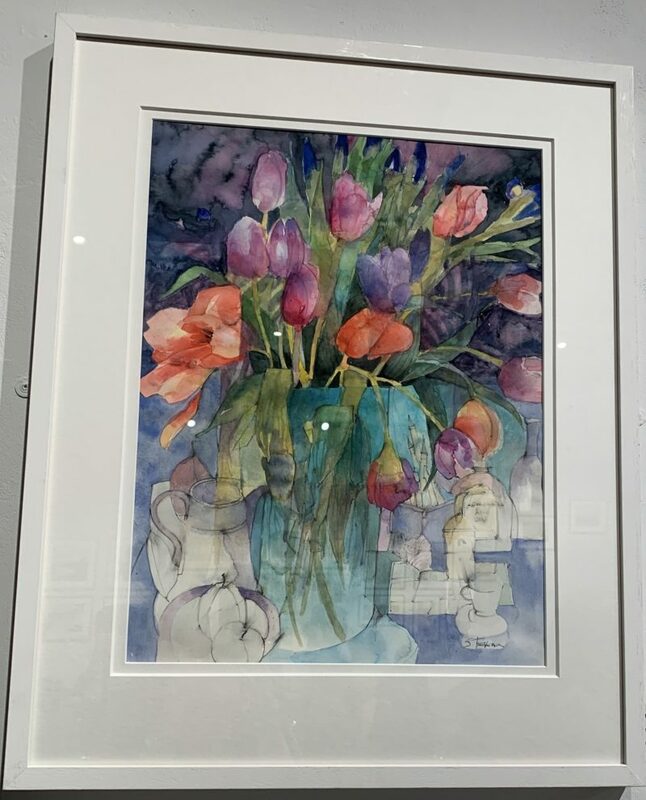 The opening day of the Royal Institute of Painters in Water Colours 207th Exhibition took place on 3rd April 2019. 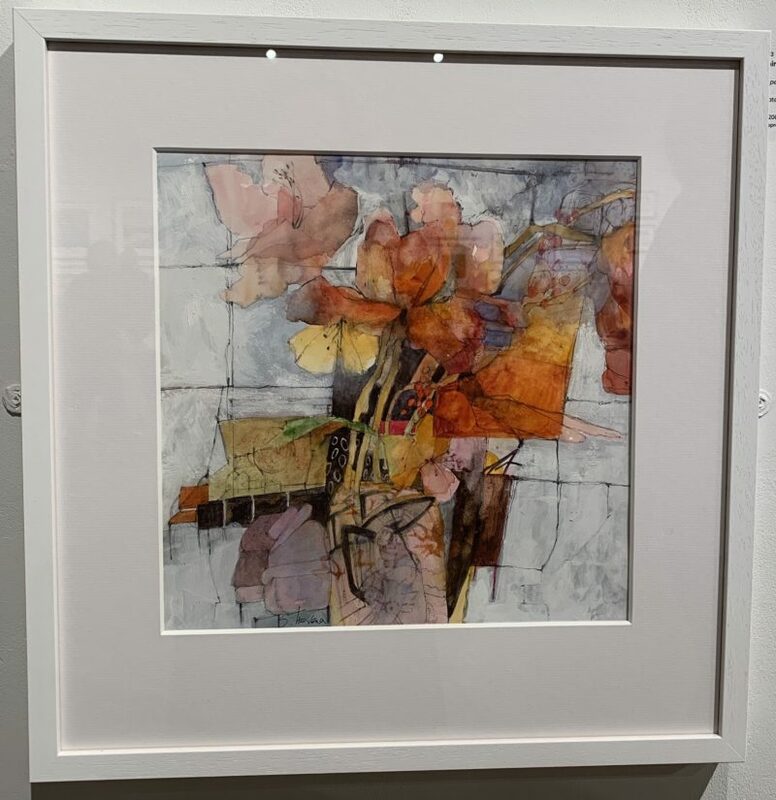 The exhibition is on at The Mall Galleries until 18th April 2019. This is my must-see exhibition every year. 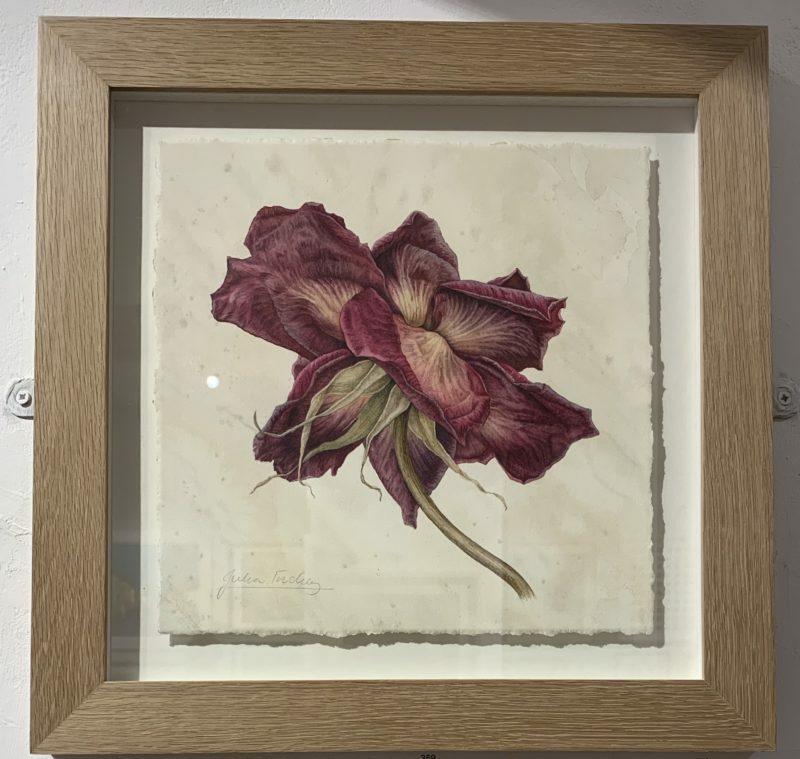 It is a showcase of the breadth and depth of this medium; a display of many styles of work, all in watercolour or water-soluble mediums. I managed another visit this week on my way to some meetings in London and found it just as inspiring the second time around. If you can’t get to the exhibition, the RI’s 207th Exhibition catalogue is online on their website. Some of the paintings I was drawn to were the simplest ones. It’s a real challenge to do simplicity this well. It takes exceptional expertise. 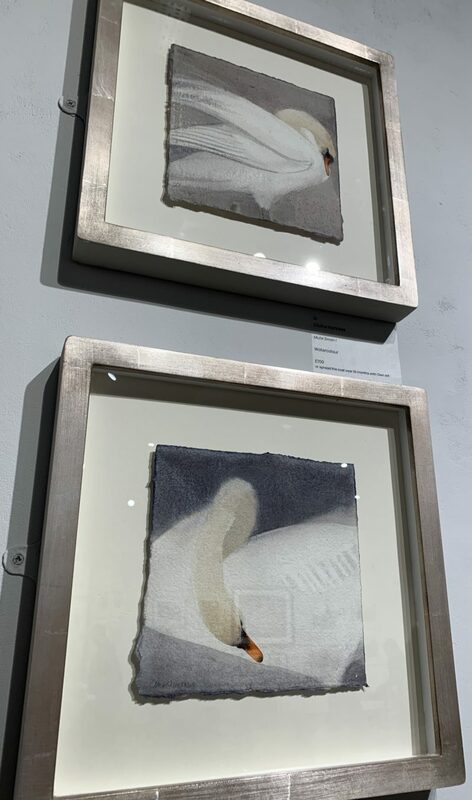 The outstanding works by Lillias August RI were all worth mentioning and one in particular was acknowledged with two awards: Empty Nests was the recipient of The Escoda Barcelona Award as well as The Megan Fitzoliver Brush Award. 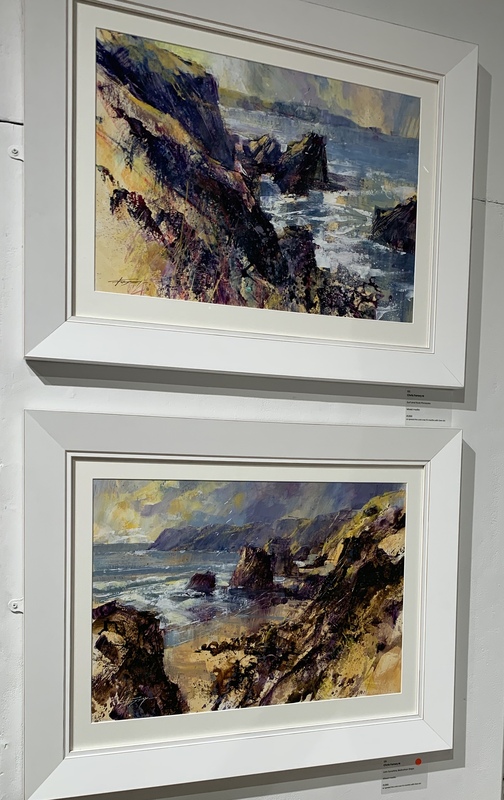 I didn’t manage to get photographs of Lillias’ paintings, although they can be seen here on her Facebook page. Harbour Church, LIttle Kitty and All Girls Together. 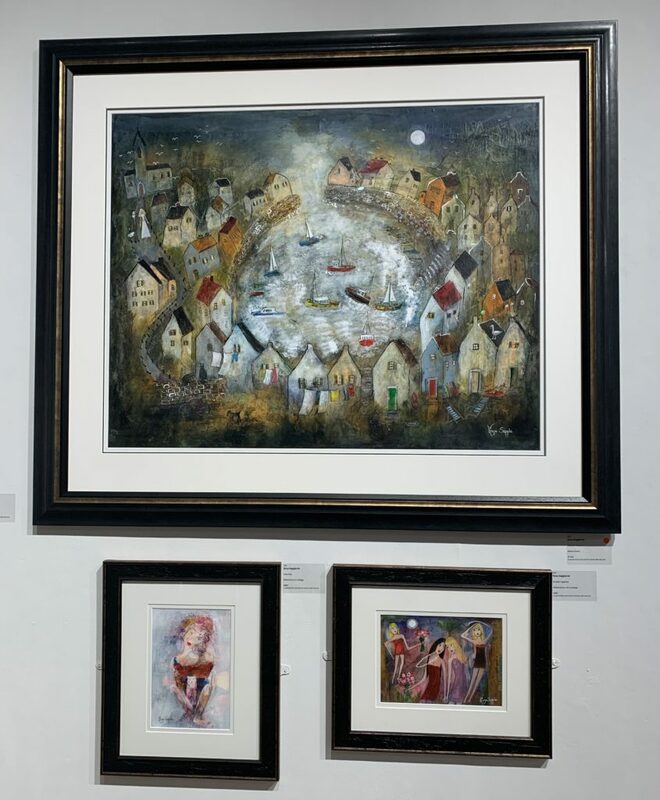 Paintings by Rosa Sepple PRI. 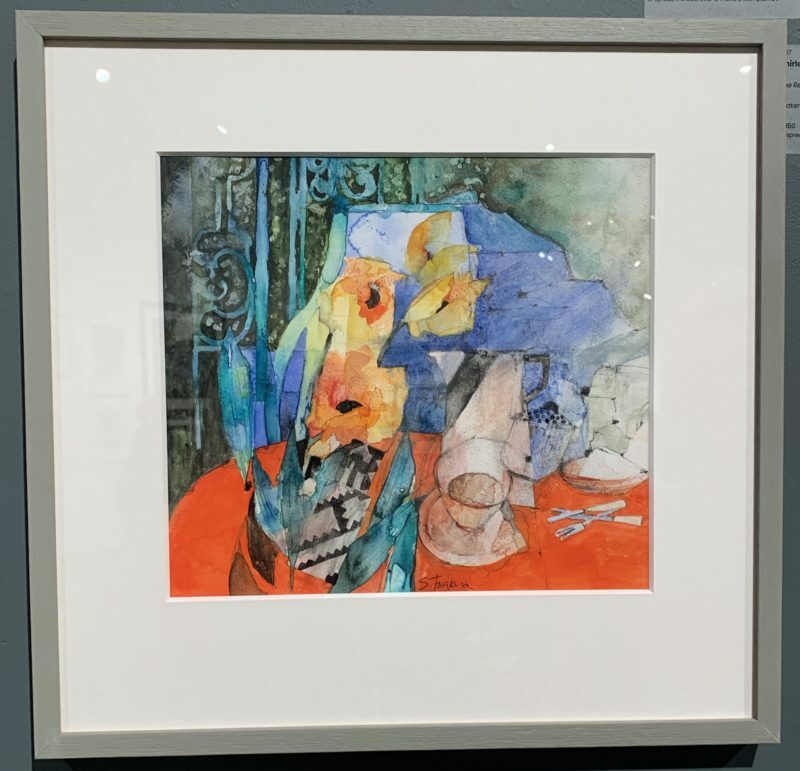 RI President, Rosa Sepple’s collection were a particular highlight. Her painting, Harbour Choice was the centre piece of the main gallery. It is a large painting with a real presence that draws the viewer in. 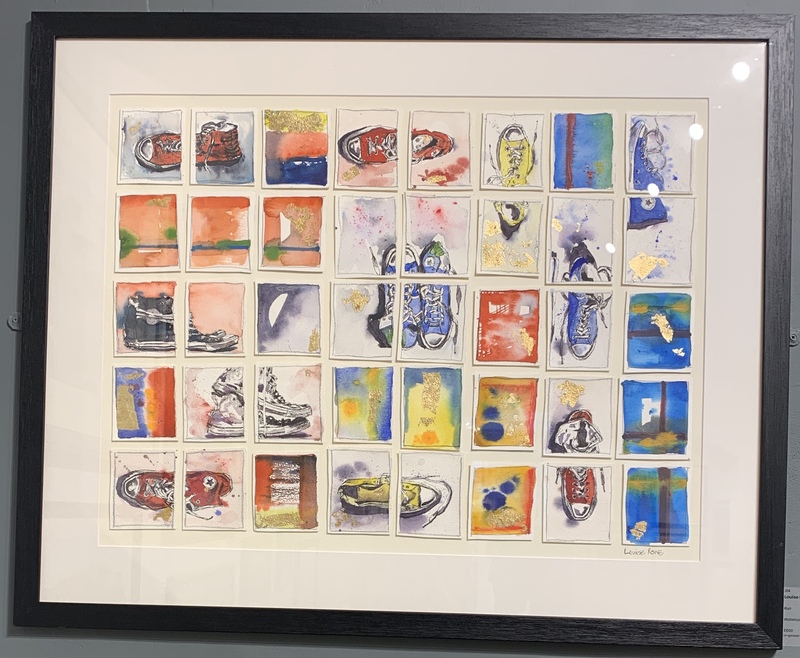 I saw one visitor standing alone in front of it for ages gesturing at various features in the painting with his catalogue, while he ran a very personal commentary to himself. He was completely absorbed in the painting. 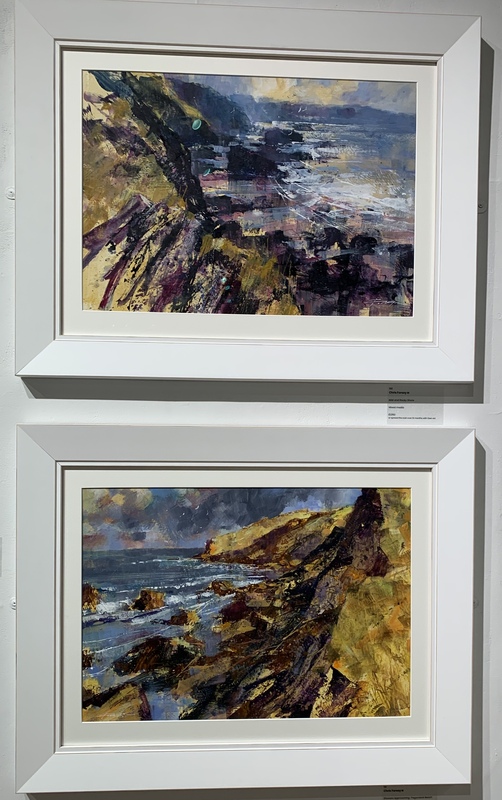 Chris Forsey RI exhibited a collection of works showing rugged coastal views of North West Cornwall. 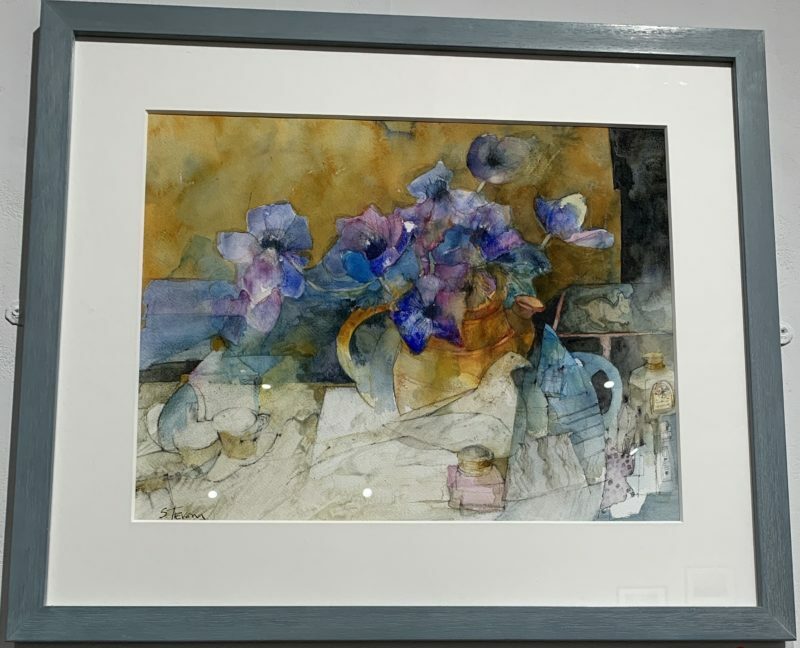 Shirley Trevena never fails to captivate with her vibrant colours and shifted perspective of the world. Always different, always beautifully individual. 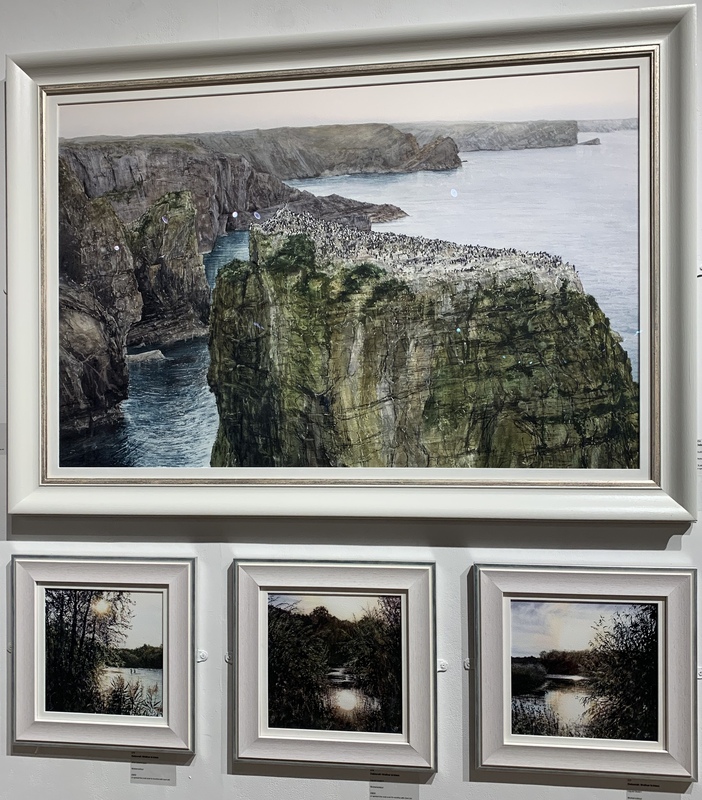 I had to wonder whether the magnificent monolith in Deborah Walker’s painting was the one of the stacks at the Green Bridge on the Pembrokeshire coast. It reminded me so much of standing there in the wind sketching the birds last June. 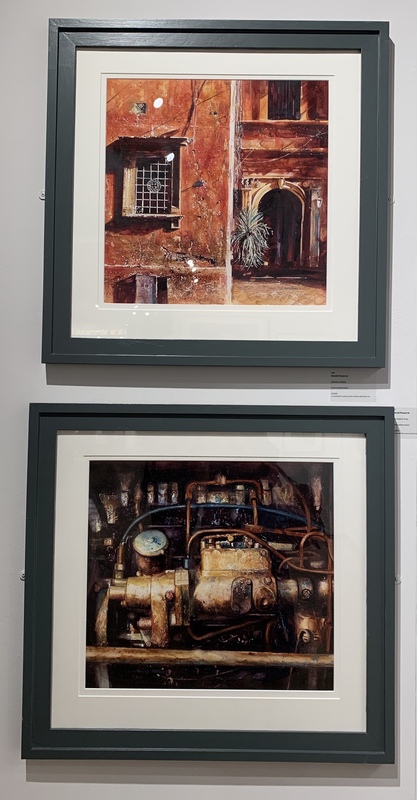 David Poxon RI incorporates texture and light to give old equipment a new lease of life. Although I didn’t get photographs of his work, another artist whose work never disappoints is David Parfitt RI. 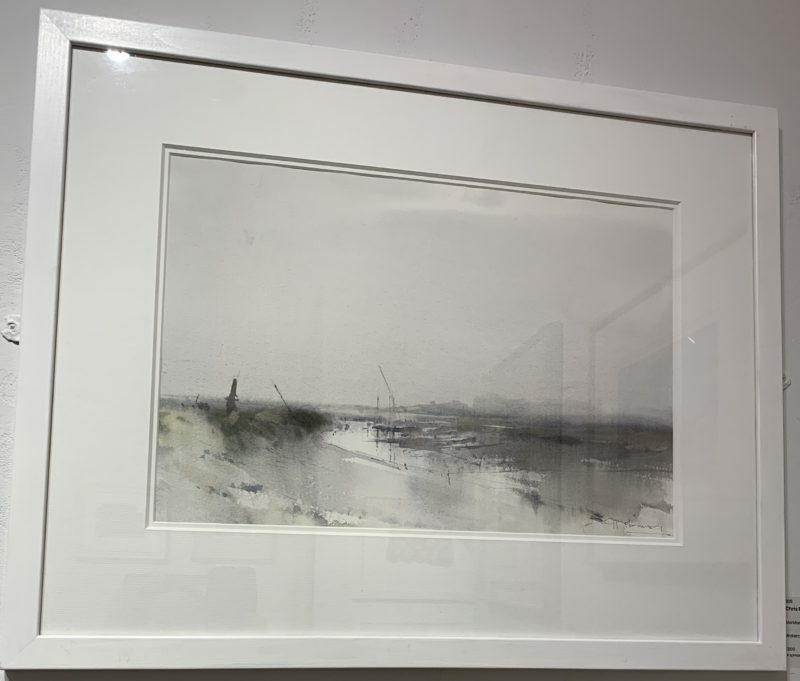 His collection in the main gallery show his mastery of light in the landscape. Dynamic and different, and with a real sense of a love of running. 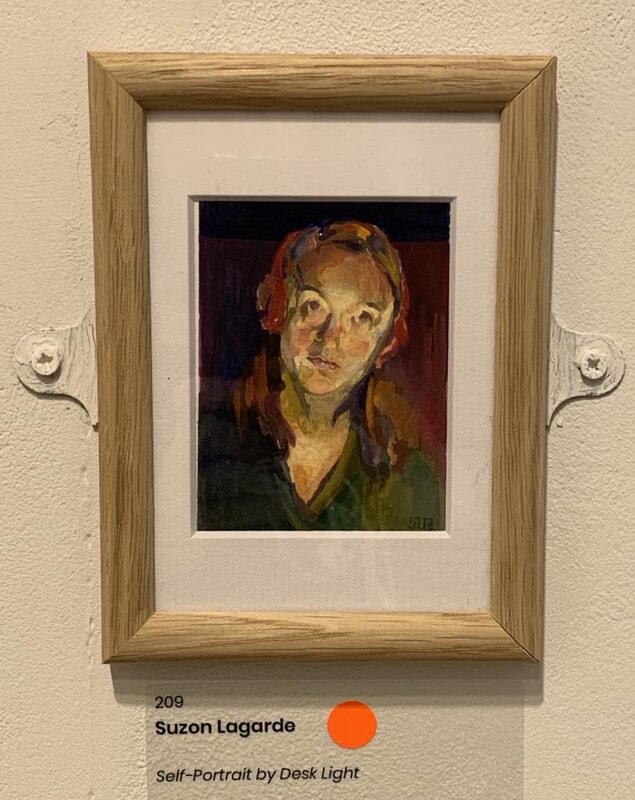 And finally the smallest painting in the exhibition: only the size of a postcard – including the frame. 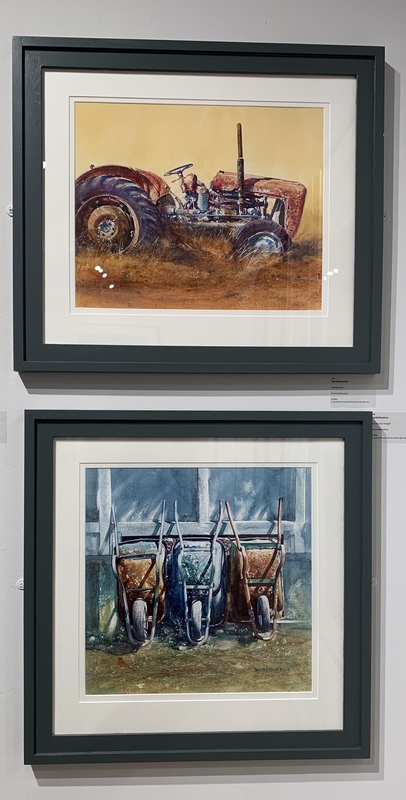 The 207th Exhibition of the Royal Institute of Painters in Water Colours is on daily from 10am to 5pm. The exhibition just seems to get better every year. 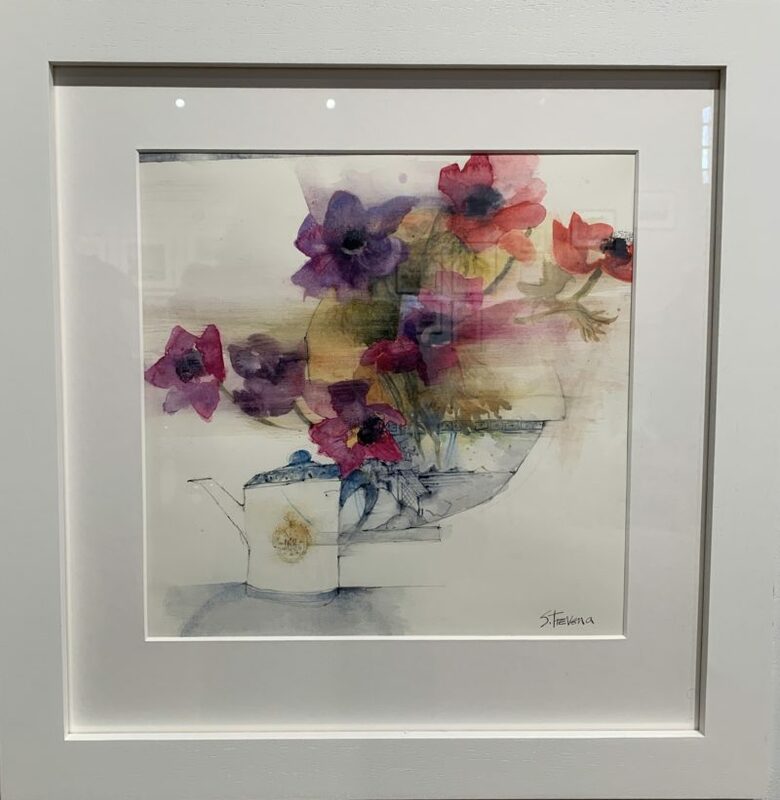 Its my favourite watercolour event. while reaching out to others.